CSIR NET Admit Card 2018 (Released) – Download Here CSIR NET December 2018 Admit Card CSIR NET Admit Card December 2018, Steps to download Admit Card. csir ugc net admit card . 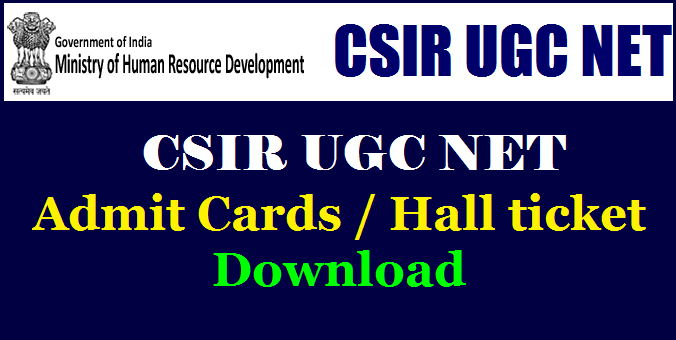 CSIR UGC NET Admit Card 2018 - The Council of Scientific and Industrial Research (CSIR), Human Resource Development Group has released the notification for Joint CSIR UGC NET December 2018. Council of Scientific and Industrial Research (CSIR), conducts Single MCQ Examination (Joint CSIR - UGC Test) for the Award of Junior Research Fellowship (JRF) NET and appointment for Lecturer (NET). On behalf of UGC, the National Eligibility Test (NET) is conducted for determining the eligibility of Indian nationals for the Eligibility for Assistant Professor only or Junior Research Fellowship & Eligibility for Assistant Professor Both in Indian Universities and Colleges. Till recently, the CBSE conducted the NET in 84 subjects at 91 selected Cities of spread across the country. From Dec 2018 onwards, the UGC- NET (for Eligibility for Assistant Professor only or Junior Research Fellowship & Eligibility for Assistant Professor both), will be conducted by the NTA. Declaration of Result on NTA’s website By 10thJanuary, 2019. Candidates who have register for Joint CSIR UGC NET December 2018 Exam will be able to download the admit cards from the official website once released. No hard copy of admit cards will be issued to any candidate. Note : The Candidates may download their Admit Card by entering Application No and Password or Application No and Date of Birth.